Zuid-Holland is the stereotypical image of Holland that most foreigners have of the Netherlands: windmills (although these historic icons are being replaced by modern wind turbines), canals, dykes, quaint drawbridges, and of course tulips. Two of the Netherlands most well-known cities: Rotterdam (one of the world’s busiest seaports) and Den Haag (The Hague), the official seat of government in the Netherlands, are located within the southern province of South Holland. The province is bordered by the North Sea on the west, the province of Zeeland to the southwest, the province of Noord-Brabant to the south, the provinces of Utrecht and Gelderland to the east, and finally the province of Noord-Holland (North Holland) to its north. A large portion of the land comprising this province is below sea-level and centuries ago most of the land was a swampy delta where the various tributaries of the Rhine emptied into the North Sea.  Over the centuries the borders of this province have changed significantly, at times even being united with its northern neighbor, Noord-Holland. Its current boundaries date to around 1840. Today, Zuid-Holland is the most densely populated province in the Netherlands, and one of the most densely populated areas in the world with a population of over 3.5 million people living in just 3400 square kilometers. In addition to The Hague and Rotterdam there is much to see in South Holland. North of the Hague is the university town of Leiden, which is home to the Netherlands’ oldest university. Venture just north of Leiden and you will find the tremendously colorful Dutch bulb fields. Travel just southwest of The Hague and you can stop in the town of Delft, known for its blue and white pottery. If you like cheese, then a stop further east of Delft in Gouda is a must. Just southeast of Rotterdam, you can take in the famous 19 windmills (now declared a UNESCO World Heritage Site), which were used to drain the Alblasserwaard in the past, in Kinderdijk.